Emfrid is a Nord innkeeper at The Grey Mare in Chorrol. Emfrid sells food and rents beds. You can match her up with Bittneld the Curse-Bringer. Emfrid lives a fairly simple life, sleeping from midnight to 4am in a bed behind the counter then serving the inn at all other times. She will still rent a bed to you when sleeping but will not barter with you. She wears a coarse linen shirt with matching coarse linens and stitched leather shoes. She also carries a small amount of gold. If you catch her in a good mood, she may greet you humbly: "An honor to serve you. I'm Emfrid, owner and publican of the Grey Mare, at your service. A room? Or food? Whatever you wish." Asking about Chorrol, she will express her concern about the recent assassination: "In Chorrol, we don't think much about what goes on in the Imperial Palace. But these murders... the emperor and all his sons dead... what's next?" Before you bring Martin to Cloud Ruler Temple, you can ask her about Jauffre: "The old fellow? At Weynon Priory? It's a small community outside the walls, southeast of the Chorrol gate, on the Black Road." After Dar-Ma's disappearance, you can ask Emfrid about her: "Dar-Ma is the daugher [sic] of Seed-Neeus, the owner of Northern Goods and Trade. You'll often find her out taking the air near the Great Oak." During Fingers of the Mountain, she will tell you about Earana's stay: "She's staying in one of the rooms upstairs, though she seems to spend most of her time down by the Mages Guild." Before you have finished the mini-quest, Bittneld and Emfrid, she will reflect her thoughts on Bittneld: "Bittneld -- captain of the castle guard? -- he seems like such a nice fellow. Too bad I don't see him in here very much." When you've finished the quest, she will appreciate your input: "Did you say something to Bittneld? That was very sweet of you. Now he stops by here every day." At that point, she may say the following things to Bittneld: "I've made you a little pumpkin bread... something to keep up your strength on those long night watches. ", "I've put aside a little mead for you. I know you like it." or "The bread's hot and fresh, with a nice crust, and butter and honey, just like you like it." Bittneld, in return, may say the following things to Emfrid: "It's been a long day. Quite pleasant to look forward to seeing you here. ", "I really must thank the one who recommended you -- and the Grey Mare. Always a splendid feast for my spirits. And the food is good, too." or "After a long day up at the castle, it's refreshing to spend a time with someone as charming and thoughtful as you." 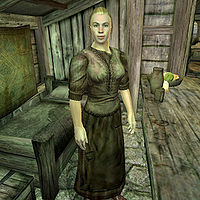 The people of Chorrol have a good opinion of her inn: "The Grey Mare isn't a bad place to stay, especially if you're low on Septims." "Have you spoken with him already? Please, say you have." "I've not spoken to him." "You haven't? Why not? Is this just a game to you? I'm sorry. Please. Just come back to me when you've spoken to Bittneld." Yes, I've spoken to him. "You've spoken with him? Really? What did he say? I beg you, tell me." "I knew it! I knew a man like Bittneld wouldn't be interested in those other women! Ha! They parade around in their fancy clothes and their expensive perfumes. What do they know? All fluff and no fiber. That's what I say. But...what if we're wrong? Bittneld has traveled the world, while I've spent my whole life in this tavern. No matter. Will you ask him to visit me? I would be most grateful." "You've spoken to him by now, haven't you?" "Yes, I've spoken to him." Followed by the same replies as above. Esta página foi modificada pela última vez à(s) 22h52min de 2 de junho de 2015.